← April Family Sundays Featured the Art of Amulets! 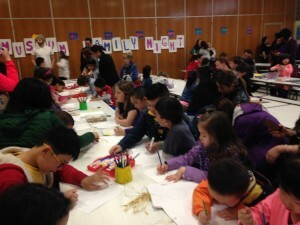 Last week, we celebrated our fourth year of partnering with PS 32 in Queens with a fun Family Art Night! In February and March, Rubin Museum educators worked with the entire third grade to discuss Himalayan Art and support classroom teaching. 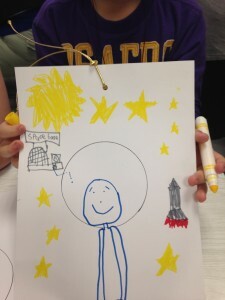 During the Art Night, students displayed their work for parents, siblings, and other students to appreciate and participated in various art activities. There were over 200 people in attendance! 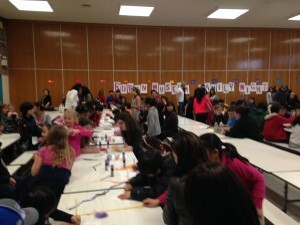 Parents and students filled the cafeteria to make protective amulets, journey scrolls and a collaborative map. The theme of the evening was “Journeys.” Students and parents considered places they woudl like to visit and placed these on the map. They also depicted exciting real and imaginary journeys on their journey scrolls. 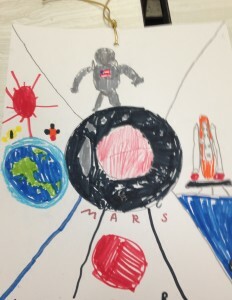 It was inspiring to see all the creativity and imagination coming out of the event. We look forward to working with all the wonderful teachers, administrators, students and parents next year! You can read more about Thinking Through Art residencies here. 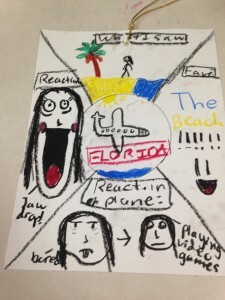 This entry was posted in Art Making, Family, Himalayan Art, K-12 Schools, Outreach, Uncategorized. Bookmark the permalink.